You had me at the jar full of pudding! #7 Dr. Acula (dracula) I want to meet the parrot in #9. Some of the others I would love to be there when you do it--like #6, #4 and #10 and #1. Sounds fun!! Yesterday Robyn was cleaning the bathroom and Eye of the Tiger came on Pandora. If it works for bathroom cleaning it definitely works for joggers. I remember seeing this list a long time ago and I remember feeling the same way. I would love to do all of these things, as we both know that I am a lover of all things irreverent and always toeing the line of inappropriate. 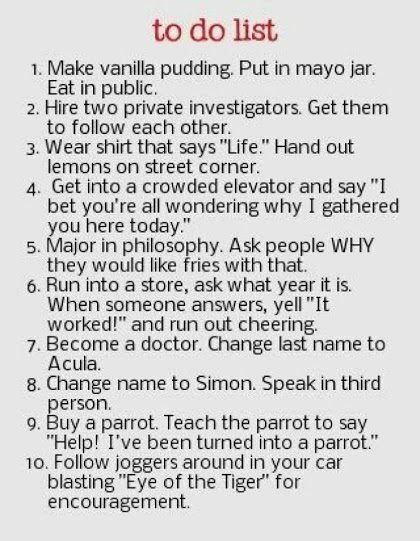 I would love to be with you while we tackled this list together. And now if someone is following me and blasting "eye of the tiger" when I am running, I'll know why. Why would you like fries with that?